Parmi arrived at our stable in 2007 just before he turned 4, so that he could begin his training with me. 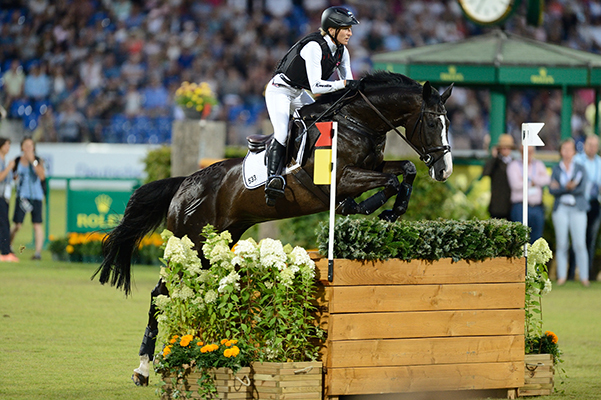 His big canter combined with his bravery and his jumping talent are his greatest strengths. He jumps with great joy over everything across country. I had the feeling from the start that this is where he belongs. In show jumping he is attentive, eager, careful and clears each jump with ease. He finds it a little harder in the dressage arena to concentrate and stay relaxed however he is improving with time. He was a sensitive loner when he first arrived but now he loves his stable buddies. Full of energy and leaping about for the sheer joy of it, he is always fun to ride. In the 2009 season he won several M level jumping classes and gathered a lot of experience at cross country competitions. As a 5 year old he won the bronze medallion for eventing at the Bundeschampionat in Warendorf as well as placing in the final of the 5 year old jumping horse class. 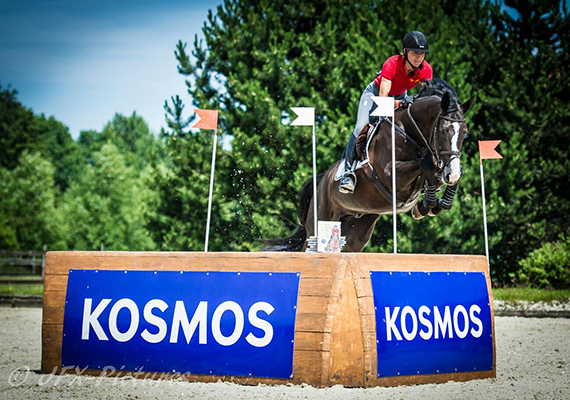 He became the first horse in the history of the Bundeschampionat that was successful in the final of 2 disciplines, cross country and jumping. He gained lots of experience in 2010 and 2011, in CIC* and CIC** competitions as well as pure jumping classes, winning classes up to M**. A start at Aachen in the S class over ditches and big walls as well as the World Championships for Young Event Horses in Le Lion d’Angers (CCI**) was a very successful end to the season; his jumping and cross country starts not only felt lovely but he also placed. highlights were Marbach and the World Cup in Malmö. Here Parmi had once again shown us as an 8 year old that he found this level very easy. Due to an injury we decided Parmi could have a well-deserved break. Parmi went back home to the stable of his breeder in Hessen and I am very happy now that he is back in our stable once more.The 2014 season began in Gahlen with the indoor cross country, where he eagerly placed 2nd. Together with his breeders and owners, Marion and Eric Gottschalk, we have made the decision Parmi should just do pure showjumping. It is obvious when he jumps how much he loves it. He won a S* jumping class and won the speed derby in Bonn Rodderberg. We had lots of enjoyable rounds and placings in the 2015 season including our first 6 Bar. Further wins and placings followed in the 2015 season. The season began well with 2nd place in the speed class M in Gahlen and ended with a win in the S jumping class in Warstein. Parmi doesn’t stop at Germany- we won our first John Deere Tractor in Stockholm in the Indoor Derby Event. We have also cracked the 2 m barrier in the 6 bar class! In 2016 and 2017 Parmi won again at S level and continues to bring me so much joy in show jumping and indoor cross country. Also in 2018 Parmi and I conquered new competition courses such as Donaueschingen and won there the jumping competition Kl. M * with terrain obstacles. 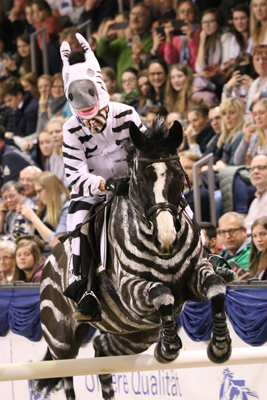 With fast rides at the Indoor Derby Events he won both in Stuttgart and in Stockholm. For the grand finale there were two valuable awards: a journey for two people from pferdesafari.de and our second John Deere tractor.